En: I would really love for this March to be yummy, but the weather is so so bad in my part of the world ( i hope you all had an amazing 1st of March). I am pretty sad i can't get out yet from my jackets and sweaters. The plaid shirt is still my favourite one this season. First , I really feel this trend is specially made for laid-back weekends and second , i fell that this is the trend that keeps returning season after season. Ro: Imi doresc did tot sufletul ca Martie sa fie yummy , dar vremea este atat de urata in partea mea de lume ( sper ca ati avut un 1 Martie minunat). Sunt destul de trista ca inca nu pot sa renunt la geci si pulovere. Camasa in carouri este inca preferata mea din acest sezon. In primul rand, cred ca acest trend este special facut pt zilele linistite de weekend si in al doilea rand, cred ca acesta este trendul care mereu revine, sezon dupa seson. you look awesome honey!! !love the boots!kisses! 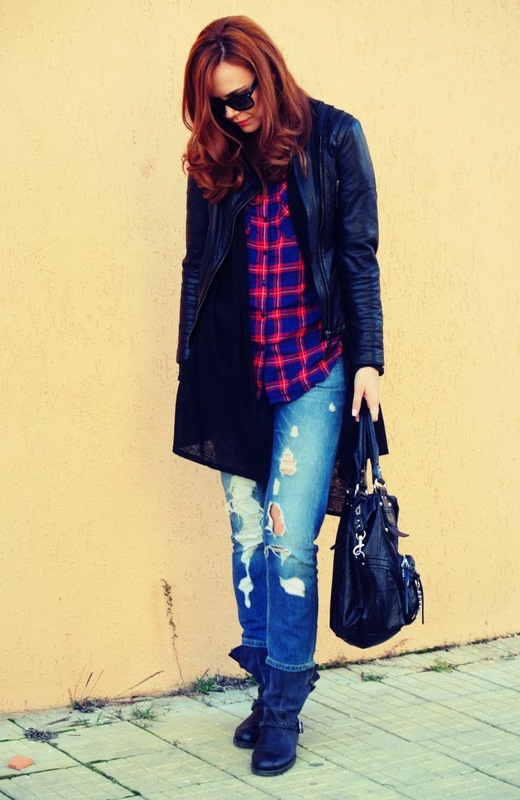 Love your look but specially your jeans and boots :) nice post. Lovely boyfriend jeans, perfect pair! Well, as you said plaid a shirt is the best for those lazy weekends..
love your jeans! this casual outfit is so chic! Love this outfit! Your super rocker chic! I love your jeans, you look so good! Love the colors in your shirt! Love your ensemble! Your hair is fab also! Great look dear!Love your jeans! Amazing look and fab pics!!!!!!!!!! Hello sweetheart, tnx for the invite to follow. Now following you on GFC, GOOGLE+, BLOGLOVIN AND FACEBOOK. Draga mea, sa ai parte de o primavara la fel de frumoasa ca tine. Soo excited for March as well, I hope the weather gets better! I like your style very much thbag is perfect ! Dear, I have a page on facebook (facebook.com/trezgraus), do you like it and share it? Maybe you're interested in following each other? I would love it!! ❤ Let me know in a comment on my blog! Great look. Love the checkerd shirt. Hi Sorana. Even here in Italy the weather is awful! With this outfit, you're so sweet.....very nice your jeans!!!! La Pull and Bear n-am mai intrat demult, o sa arunc si eu un ochi curand, sunt in cautare de jeans. Love your jeans, such a great and comfy combo! cool pants!! love your shirt!